Version Cue, Adobe's server-based version control and file-sharing management tool became quite easy to use with the CS3 version, so it was safe to assume that the CS4 upgrade would remain essentially unchanged. In many ways it’s true: Version Cue CS4 is largely unchanged. But in a few key ways, it has changed dramatically. The result is that Version Cue is now less complicated to use overall, but it requires more steps for users to take advantage of its file-sharing features. The updated project manager no longer complicates suite apps, and leaves what already worked well alone. Note that when Creative Suite 4 shipped last October, Version Cue contained a bug that rendered the new version nonfunctional (Adobe disabled Version Cue in the original CS4 shipping version). Later, it released the 4.0.1 update as a free download and this analysis is based on that updated, functional version. The biggest change in Version Cue CS4 is in its client software, which ships with the following bundles: Adobe Creative Suite 4 Design Premium; Design Standard; Web Premium; Web Standard; and Master Collection. It no longer adds a parallel universe of dialog boxes in the various CS4 programs, as did previous versions. Gone is the Adobe Dialog button in Open a File, Save As, and other file-oriented dialog boxes that let you manage shared files in a workgroup. This change simplifies the dialog boxes, ending the confusion as to whether you need to have them set to display Version Cue functions, such as creating new projects and undeleting files. But the price for that simplicity is that you no longer manage projects from within the various CS4 applications while you use them. Instead, you must switch to Adobe Bridge to manage the projects that comprise your shared files by choosing Tools > Version Cue (and first enabling the Version Cue start-up script in the Bridge preferences, as it is not on by default). That's not a terrible burden, but it does tend to make using the project-management features less convenient. You can still access Version Cue servers via the Open, Export, and Save As dialog boxes in each application, but there are no longer separate VC-enabled dialog boxes to switch to as in CS2 and CS3. On the plus side, Adobe has made it easier to find the shared files. Before, you could access them only from an Adobe app such as Photoshop or Bridge. Now, these shared files appear on your desktop as if they were network drives, so you navigate to them as you would any other file share, using the standard Mac commands. Ditto for adding, renaming, and deleting files. This change makes the use of Creative Suite projects more intuitive. My only beef with the new approach is that getting to those virtual network drives can be confusing. The simplest way to get to a shared project is to Control-click the desktop and choose More > Adobe Drive > Connect To from the contextual menu (in Tiger, you won't need to go through the More menu option). When Adobe Drive opens, you then click the Version Cue button to get a list of available shared projects to connect to through a virtual network drive. Adobe's goal is to offer lots of virtual drives through Drive, such as Web-based shared drives, so it added Drive in CS4 as that shared facility. But doing so adds an extra step to accessing your Version Cue projects. When you first connect to a Version Cue shared project via Adobe Drive, you have the option of automatically reconnecting to the shared project each time you start the Mac, which makes this extra step just a one-time additional effort per shared project. If you open Adobe Bridge CS4 instead and choose Version Cue from the Favorites list, you skip the Adobe Drive intermediary—instead, Bridge becomes that intermediary. In that case, you click the Version Cue "drive" in Bridge's file list or open Version Cue in the Tools menu to see the projects available to you. Although the file-sharing controls are now gone from the Version Cue client, it retains the check-in, check-out, and version management controls of the previous version. These controls work as they did in CS3. I'm glad Adobe left these controls unchanged, as they work well. 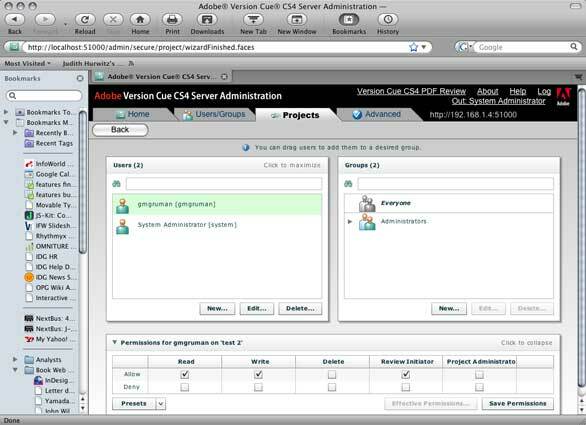 You use a browser-based admin console to set up Version Cue projects—the virtual servers are where you place related project files for workgroup access. The Version Cue Server that comes with the Creative Suite 4 bundles is also essentially unchanged; it’s still managed through a browser application that you access from the Version Cue CS4 system preference or the optional menu bar control (just as in Version Cue CS3). You don’t need to be online or even have Internet access to use this app. The only notable alteration is that Version Cue CS4 imports CS3 files, while Version Cue CS3 imported CS2 files. If you have both Version Cue CS4 and CS3 installed, they continue to operate independently. The net effect of the changes to Version Cue CS4 is to make it less obtrusive when you're working in various CS4 apps and to provide a more intuitive way of accessing shared files (as virtual network drives). Adobe wisely left the version management features alone. A little more simplification would be nice, but that's more of a quibble than a complaint.